NSCC President Dr. Michael Thomson signs the “Presidents for Entrepreneurship Pledge.” He is pictured with NSCC business faculty member Lisa Becher, who is instrumental in Entrepreneurship education, training, and networking opportunities at the college. The National Association of Community College Entrepreneurship (NACCE), the nation’s leading organization focused on promoting entrepreneurship through community colleges, has announced that Northwest State Community College President Michael Thomson has taken its Presidents for Entrepreneurship Pledge. Through the pledge, presidents of community colleges throughout the country pledge to take five action steps that will increase their focus on entrepreneurship and the impact these colleges have on the economic well being of the communities they serve: develop transparency of community college and community assets; create internal and external teams dedicated to entrepreneurship; increase entrepreneurs’ engagement in community colleges; engage in industry cluster development; and create broad exposure to the college’s commitment to entrepreneurship. More than 200 community colleges throughout the country have signed the entrepreneurship pledge, committing themselves to playing a greater role in stimulating economic development in the communities they serve. The pledge is in response to the Obama administration’s Startup America call to action to stimulate economic growth state by state by encouraging entrepreneurs to start their own businesses. NACCE is a founding affiliate of the Startup America Partnership, an alliance of the country’s entrepreneurs, corporations, universities, foundations, and other leaders. 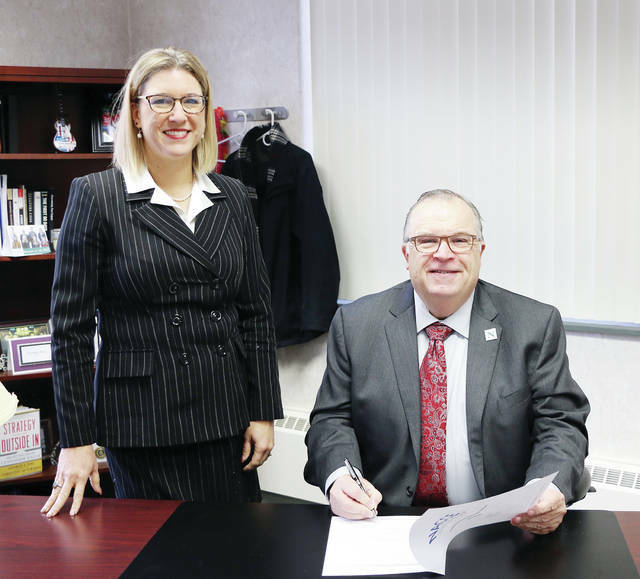 https://www.fcnews.org/wp-content/uploads/sites/45/2018/12/web1_NSCC.jpgNSCC President Dr. Michael Thomson signs the “Presidents for Entrepreneurship Pledge.” He is pictured with NSCC business faculty member Lisa Becher, who is instrumental in Entrepreneurship education, training, and networking opportunities at the college.